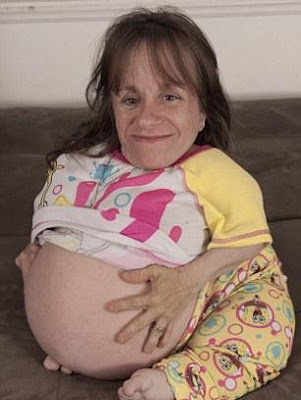 The world’s smallest mother is about to give birth for the third time - despite warnings she is risking her life. Stacey Herald, who is just 2ft 4in tall, was told that becoming pregnant could kill her, but bravely defied doctors to have two babies half her height. The 35-year-old from Dry Ridge, Kentucky in the U.S. suffers from Osteogenesis Imperfecta, which causes brittle bones and underdeveloped lungs, and means she failed to grow. Now Mrs Herald, who uses a wheelchair, and her husband Will, who is 5ft 9in, are eagerly awaiting the birth of their third baby, due in the next four weeks. Currently as wide as she is tall, she cannot hold her daughter because her belly gets in the way, and has to rely on her husband to do most things around the house. She admits being pregnant is ‘uncomfortable’ and leaves her bedridden for weeks on end. By the time the new addition, a boy, is one he will already tower over his mother. But despite all the obstacles, the mother and father, a trainee priest, say they want even more children. The couple met in 2000 while working for a supermarket in their home town and were desperate for a family after marrying in 2004. But doctors warned Mrs Herald a baby would grow so large inside her tiny body it would eventually crush her organs, strangling her from the inside out. Mrs Herald said: ‘It broke my heart that I couldn’t have kids. Eight months later, the couple were thrilled when they discovered they were expecting and decided to go ahead even though family and doctors begged them to reconsider. Mrs Herald, who had decided not to take contraception, said: ‘They all told me that I would die. They begged me not to have a baby. After 28 weeks, doctors performed a cesarean section and daughter Kateri was born, weighing just 2lbs and 1oz in 2006. She grew well but there was heartbreak for the family when they discovered Kateri had inherited Mrs Herald’s condition and would also never grow to a normal height. But the young family resumed life as normal, before Mrs Herald fell pregnant a year later. She said: ‘It was kind of like the last time, everyone screamed: “What are you doing?” at us. ‘The doctors told me I was pushing my luck. But we just prayed that God would bring us through it.’ However this pregnancy took its toll on the little mother. She said: ‘It was hard, I got so much bigger faster. At my worst point I remember bursting into tears, because I looked like a beach ball with a head and little feet. ‘I spent weeks unable to do anything for myself because my stomach was so big. At one point I dislocated my arm when I was moving from my chair into bed, because I just wasn’t used to the weight on my arms. ‘I’ve always been able to do everything but this time I just couldn’t and I found that really upsetting to have Will help me wash and go to the toilet. Doctors tried to let the second baby stay in her body for as long as possible, letting her pregnancy go to 34 weeks before wheeling her into theatre. Daughter Makaya who, at 18 inches was more than half her mother’s body length when she was born, weighed 4lbs and 7oz. Now both girls are bigger than their mother who is 30 weeks pregnant with her first boy. She said: ‘It’s getting tougher and tougher to move. Mrs Herald added: ‘All my babies are miracles, but we haven’t thought about if we’re going to have some more, as they”re a real handful right now. She should be happy with the ones she has now and stop tempting fate.